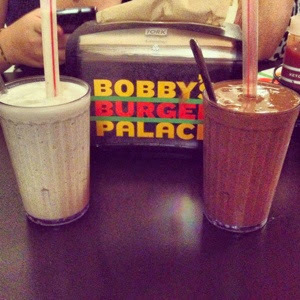 Bobby’s Burger Palace, aka BBP, is unlike any restaurant I have ever been to. Normally at restaurants you’re seated first and then you place your order, but not at BBP. At BBP you line up at the front cashes to place your order. Once your order is placed, you are given a number to put on the table of your choice, either inside or on their large terrace. The waiters and waitresses find you by your table number and deliver your food. A mix of old school drive through and cafeteria type of dining – neat concept! Standing in a large line (they really should have more than one cash opened at a time), we had more than enough time to decide on what we wanted to eat. 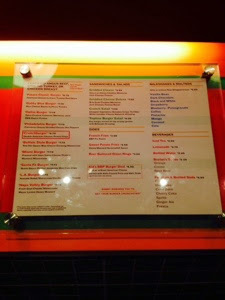 They display their concise menu on the wall for everyone to see, and they also have printed ones all over. Staring at the enormous menu hanging on the wall, we all changed our minds over and over. I finally decided on the Buffalo Burger, my sister the Napa Turkey Burger, My mother had the same but with an Angus beef patty and my father ordered the Philadelphia Burger. We also ordered fries, sweet potatoes fries, onions rings, a vanilla milkshake, and chocolate milkshake and a couple of cokes. We were given our table number on a plastic place card, and two empty cups to fill at the self-serve machines. We filled our glasses and headed to the terrace to grab a seat. Within minutes our shakes arrived. The front of house staff is more than friendly and really gets the job done well. I ordered the vanilla bean shake. I had always said I wanted to have a good shake and a burger, today was the day. My shake was absolutely delicious. The vanilla bean flavour was present and I really enjoyed that even though the shake was thick, I had no trouble drinking it through the straw. My sister had the chocolate shake and really enjoyed it as well. The chocolate flavour was delicious and not overly sweet which I really enjoyed. This being the first time I ever had a milkshake and a burger; I must say this combination is quite satisfying. The burgers and sides arrived shortly after. As I placed my top bun on my burger, I couldn't help but be slightly disappointed with the bun. 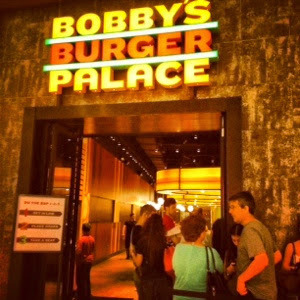 Don’t get me wrong, a plain solid bun is awesome for a burger, but this being Bobby Flay’s Burger Palace, I thought I would be getting something a little more creative. Maybe even a brioche style simple bun. That being said, the bun held up to the burger quite well and let all the flavours of the meat and sauces shine through. My burger was doused in Red Hot sauce, topped with a cooling and delicious blue cheese dressing and crispy watercress – fantastic yet simple! Even though this burger was so simply done, the flavours together made this burger really delicious. The Angus beef was cooked properly creating a perfectly flavourful and juicy burger. I really enjoyed it especially for under $8. 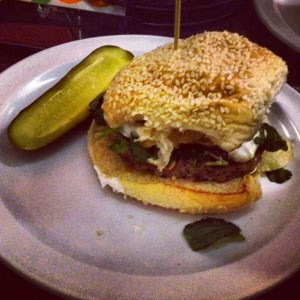 My sister and mother both had the Napa Valley burger served with goat cheese, watercress and a Mayer Lemon honey mustard sauce. My mother had the beef version while my sister had the turkey burger. Both were absolutely delicious, the turkey burger surprised us all. 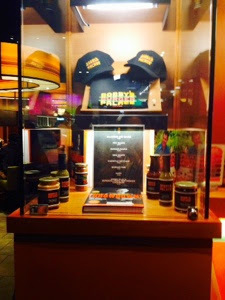 It was even better than the beef patty – truly delicious. 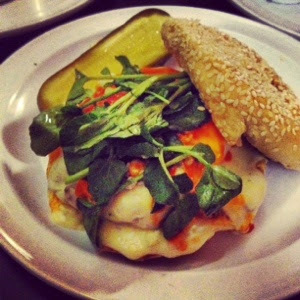 Juicy and very flavourful, this burger was a hit at our table. 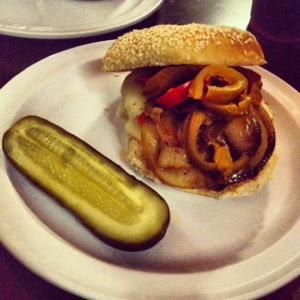 My father had the Philadelphia Burger served with sauteed onions and mushrooms. He was not impressed with his burger at all. 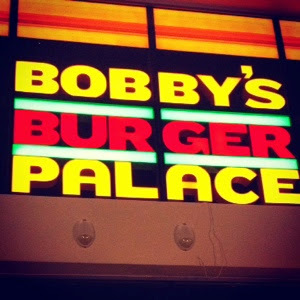 In fact he was disappointed as he was expecting something out of the ordinary from a Bobby Flay burger joint. I explained to him that for the price these were damn good burgers, it’s not like we were having $40 Kobe beef burgers with truffles and lobster mayo. I tried my Dad’s burger and it was good. Burger cooked well, topping very tasty, but I knew what he was expecting and understood why he was disappointed, he wanted a fancy pants burger. Not the right kind of burger joint Dad! Now let me tell you about the sides at BBP. 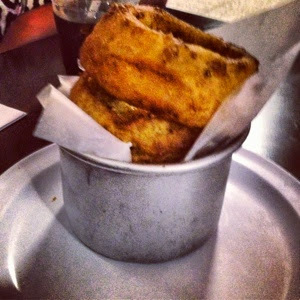 We decided on ordering three of them; sweet potato fries, regular French fries and beer battered onions rings. 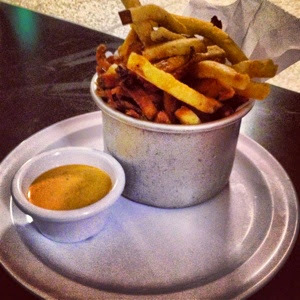 The fries and rings are served in small pails and each serving is more than enough for two people to share. I started off with the French fries which had all the proper elements of a good fry; crispy, not greasy, soft center and flavoured very well. We all agreed that these fries were delicious. 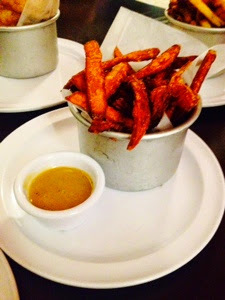 The sweet potato fries also had all the right elements – really great fries! Crispy on the outside, soft and sweet on the inside, these fries were absolutely delicious. The beer battered onion rings were huge. Actually huge is not the right word, gigantic is more like it. These colossal sized onion rings were crispy and delicious; a subtle flavoured exterior and perfectly tender onion interior. 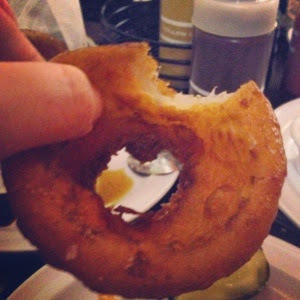 Each ring passed the “Onion Ring Test,” when biting into a ring, the onion did not get pulled out in one bite, it stayed intact with its crispy coating. I loved these rings and so did my mother, my sister and father however were not so convinced. They thought the rings were outrageously large and lacked flavour – Preposterous! The beer batter coating was packed with flavour but I guess that was just mine and my mother’s opinion. We finished up our dinner and left satisfied and extremely full. 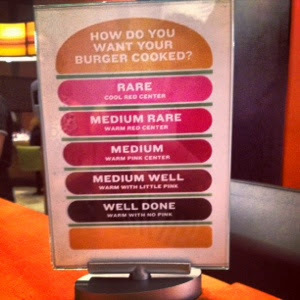 We all agreed that for the price, this was one of the better burger joints we have been to. 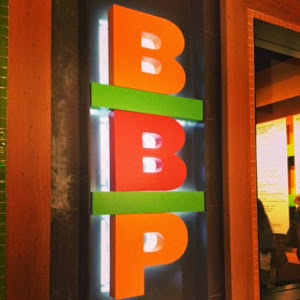 I for one really enjoyed BBP and cannot wait to return and try his brunch burger – YUMMMMM!!! !